Quote Reply Topic: Crap Day. 2nd week running I haven't raced because I'm back on the sea and the lake boys did, this week the viz wasn't good and it was a bit rainy gloomy with a forecast for lots of wind and after all the good weather and the fact it was the first time out this season, the Hythe an Saltwood Tea and Cake Eating club declined to race - the pussies. So I didn't get to try my turbo assisted wing wang in anger - gutted. I bet they had a good race down the lake. the Hythe an Saltwood Tea and Cake Eating club declined to race - the pussies. Another blow out Sunday, this time a completely weird wind angle, not especially strong and not particularly big shore dump, but high tide and the angle meant we couldn't launch and clear the rock groin then the sun came out, gorgeous day otherwise and we're not on the water, I bet the lake boys had a good day.. I get the feeling that you might be starting to understand why so many people choose to sail on lakes. the grass is greener there Graeme- leave the cover on the boat and grab a board, so you didn't race... whatever. Wasn't windy enough to windsurf, even the kiters struggled with 17 mtr Turbines (It's a model name of a light wind kite) in other words perfect dinghy racing weather, just another sign of the weird weather patterns and wind directions we've been getting of late. 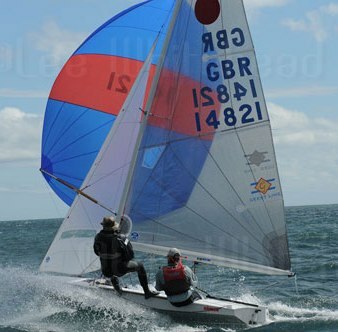 erm, the benefit of dinghy sailing is, you are supposed to be able to do it whatever the wind direction. The usual compromise is that the upper wind limit is fairly restrictive - not such an issue in UK with its prevailing light wind conditions. sometimes you've got to accept there's a fundamental problem with the location. Move to Poole Harbour when you retire. 3 More lost sea days, Sunday, Tuesday Night no wind, Thursday Night wind switched off just as we're getting the boats out, it's getting very tedious this.